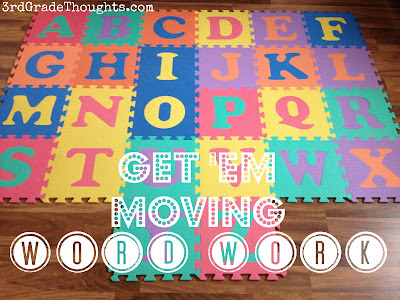 Get 'Em Moving Word Work: ABC Mats! If you're like me, you're spending an awful lot of time at various stores picking up all you need for this upcoming school year! I wanted to suggest a fun idea that I've used before for a Word Work/Brain Break idea: ABC Mats! I found these mats at our local Lowe's Home Improvement store and they were a perfect investment at only $17! Each mat is 12" by 12" and interlock in any way you choose! I set mine up in no time in ABC order and they are easy to assemble and disassemble whenever you need them. You can find them at Lowe's HERE. Mixing up the order of the letters for an additional challenge! These disassemble so quickly and take up very little room in storage, so it's a fun and active way to get your kids practicing spelling. You could also use an ABC rug, but I had difficulty finding one for less than $17, and this wasn't something I wanted out in my classroom all of the time. I hope this helped give you a fun idea for Word Work and if you need more Word Work ideas, click HERE! 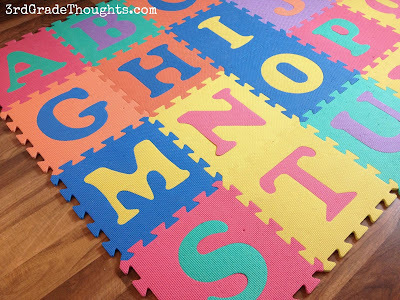 Can you think of more games to play using these ABC mats? Share them below!! Thanks so much and have a wonderful week ahead! I LOVE your ideas!! I just bought one set of mats from SAM's that have no letters but was tempted to get the ones with the alphabet. I was afraid that they would be too "baby" for my third graders. I am moving from first and having a hard time deciding what is too young and what is not. I LOVE your blog! Keep sharing! Michelle, I'm having the same conundrum. How much was your blank mat? Such a cute idea! My students love fun word work activities! I never would have thought of using these with 3rd graders! Brilliant way to get those wiggles out. *I just put together you brain breaks. I can't wait to use them this year!